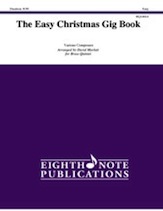 This collection is designed so that developing brass players can enjoy fun arrangements of Christmas music at a suitable level. All ranges and technical requirements have the younger musician in mind, while still allowing for all of the parts to be interesting. The melody is featured throughout the ensemble. Titles: Deck the Hall * Hark! The Herald Angels Sing * We Three Kings * We Wish You a Merry Christmas * Silent Night * Joy to the World.